The newest addition to the Mortal Kombat 11 roster is the imposing Geras, a punchy fellow whose abilities allow him to conjure up implements of destruction from the sand with which to flatten and/or impale his enemies. But he’s also got some sneakier tricks up his sleeve: Geras can actually manipulate time by rewinding it for himself, stopping it for his opponent, or even adding or subtracting time from the match clock. Geras was revealed this week at Mortal Kombat developer NetherRealm’s event in Los Angeles, and attendees had a chance to preview the game along with its newest fighter. Geras is a big grappler who isn’t particularly mobile on his feet, but he makes up for his lumbering gait with a selection of moves and abilities. Perhaps most notable among these is Lost Time & Spare Time, which he can use to either add or subtract 30 seconds to the clock. While you can’t use the ability to insta-win a match, since you can only subtract time down to nine seconds, it’s still situationally a powerful move. 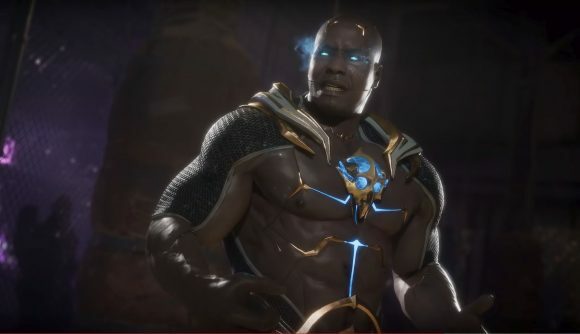 The video shows off more of Geras’ abilities as well, such as his power to go back to where he was, both in position and health, by four seconds – sort of the Mortal Kombat equivalent of Forza’s rewind feature. He can also stop time for his enemies, which you can see him use to devastating effect in his official reveal trailer – which also features him literally punching a man’s brain out through his face. Fun! Mortal Kombat 11 will be coming out April 23, and the word is we’ll be getting a pretty slick PC port this time around. When that happens, Geras will be waiting to make life interesting.